War of the Spark spoilers continue, and that’s got a lot of folks participating in some reactionary buying and selling. While it’s a bit early to call which of these cards are truly duds, that won’t stop people who are quick on the draw with snapping up singles ready to make the quick flip. Reactionary buying rules the day, and we’re seeing a ton of cards be subject to it. First thing’s first, I have to talk about Feather, the Redeemed. 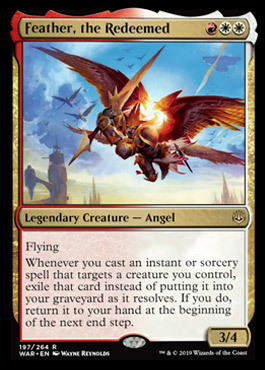 This card got a high-profile spoiling from The Command Zone, notable for their potent ability to spur movement on Commander-relevant cards due to their Game Knights video series. This is somewhat recent, as we saw the first major proof of this occur when popular cosplayer Ashlen Rose showcased her Kozilek, the Great Distortion deck back in March. Lately, I see a lot of chatter around their content and upward price movement every day in our Insider Discord. This has even led some to label it “The Command Zone Effect.” I’ve never been much of a Commander player myself, as I don’t typically enjoy multiplayer formats, but it gets harder and harder to ignore this particular piece of content the further we go. I’ll be honest in saying I make the effort to watch it every week, as soon as possible, just in case. One of the big callouts within the video this week was Sunforger, a piece of equipment that plays quite well with Feather’s ability. You’ll be able to tutor up spells for the low cost of RW to your heart’s content. Rebuying any of your spells found here is insane value, and that’s good enough reason for the quick buyout. In my opinion, this buyout will set a new price for the card long-term, and will likely lead to Sunforger stabilizing at around $8 once a bit of the hype dies down. Supply below the $10 price point has all but dried up, which leaves little room for buying in. If you bought in low or you’re holding on to these, I suggest flipping them as soon as possible. Thought Lash is another card that I’ll be watching very closely for the next few weeks, especially after War of the Spark‘s release has passed. Its interaction with the new Jace’s static ability or Laboratory Maniac is undoubtedly strong but may be an example of wishful thinking from Legacy combo players. Even with another combo piece to accompany it, I think the upward price movement on Thought Lash will likely be very short-term, and I suggest flipping them quickly. Spot removal breaks up this combo so easily, and I honestly don’t have much faith in this card’s upward trajectory for the years to come. Some would argue that it may be unwise to get rid of a Reserved List card so quickly, given the movement we’ve seen for that class of card in the last few years. I would quickly point them to Telim’Tor’s Edict to prove my point. A bit of meme-worthy gameplay was posted on Channel Fireball by Matt Nass, Sam Pardee, and Andrew Baeckstrom featuring Telim’Tor’s Edict as part of a Jenga-esque combo to put a Marit Lage token into play this time last year. Shortly after it was posted, copies were very quickly snapped up by those looking to make a quick buck (myself included), and the hype lasted for a very short period. There was some gain there, the time spent on the venture made it hardly worth it. I feel like going hard on Thought Lash may end up much the same way, as the price will quickly plummet when it puts up no Legacy results. On the flipside, I’m very happy to participate in some reactionary buying on cards like Scapeshift. A Modern staple through-and-through, Scapeshift has been present in the Modern meta at pretty much every point. The spoiling of Evolution Sage has prompted some small movement, on the off-chance that proliferating several times a turn could be a viable strategy in Standard. Should you go deep on it? Possibly! Scapeshift is at a relative low for where it once was since its Core 2019 printing, and in my opinion can only go up from here. Picking up copies for under $10 will be the safest bet for a long-term hold. Even with Core 19‘s rotation coming up later this year, I believe this is still a relatively safe pick. To add to this, Primeval Titan is an easy complement to Scapeshift that I want to highlight here for much the same reason. While it’s banned in Commander, Prime Time is seeing a bit of success in Modern in Amulet of Vigor decks that are able to compete at the top level. I pointed to this card a few weeks ago, and I’m still confident that a few good tournament results with either Titanshift or Amulet Titan could push this card up since the price drop of its Iconic Masters release. Amulet Titan recently took down an SCG Open, and looks like the first step towards something bigger. With Modern Horizons‘ release date drawing closer, it’s hard to say whether any of these archetypes will be powerful enough in the new format. Should we get more potent answers in the form of efficient counter-magic like Counterspell or Force of Will, evergreen strategies will either have to adapt to this change, or fall out of favor entirely. Some have reasoned that we’ll get more fair cards like Flusterstorm entering the format. I can’t see the future here, but if Cabal Therapist was any indication, we can at least expect classic spells like these returning entering Modern in some form. The potential for a lot of new cards to spike is still very high as we move to the end of spoiler season on Friday of this week. We’ll likely see some more reactionary Commander buyouts between now and Monday, so I recommend keeping a close eye on Twitter, YouTube, and especially our QS Insider Discord. Plenty of our members will be happy to point out their favorite picks, and offer some insights on cards you may not have considered. The value of you can expect to gain is well worth the cost of admission.